So I have some widgets that are using some custom jquery on the backend. I can get the widget forms to call the jquery files but only AFTER I've saved the widget and reloaded the page. Is there anyway to use that jquery as soon as I've dragged it from the "Available Widgets" area to the sidebar area? so that works but only after ive reloaded the page. How can I get the JS to load when the widget is activated and? And would I have to add something to my jQuery to bind the new widget form to the jQuery? 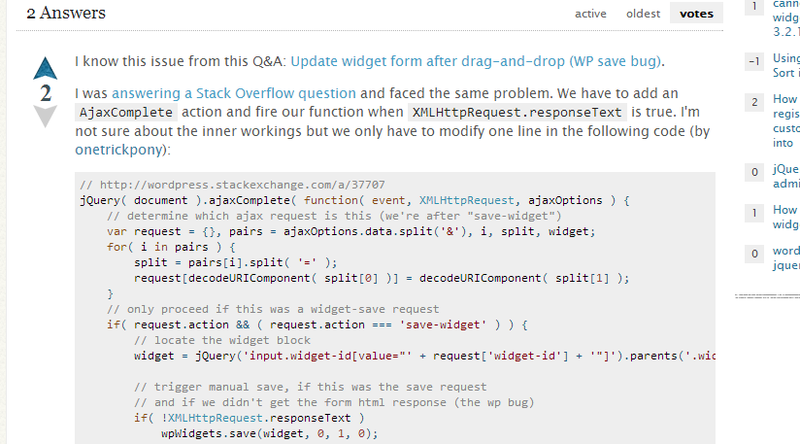 I know this issue from this Q&A: Update widget form after drag-and-drop (WP save bug). jQuery( '.test-me' ).click( test_click ); // <--- One trick, pony! Not the answer you're looking for? Browse other questions tagged widgets jquery admin or ask your own question.